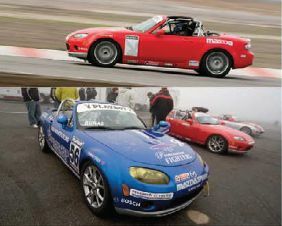 Buttonwillow Raceway, not only to prove their mettle around a track, but also to demonstrate how well they can receive and apply criticism from professional data-acquisitionists, survive interviews by a panel of champion drivers and corporate big-wigs, and assemble a winning sponsorship proposal or business plan. This year’s applicants ranged in age from 14 to 56 years old, represented professions from competitive surfi ng to mechanical engineering, and hailed from all across the country. To say the competition was fi erce wouldn’t even scratch the surface—these were the best of the best amateur racers, each looking (fi ghting) for their “big break”. At the end of a long, cold day in the California desert, after completing dozens of laps around a shortened Buttonwillow Raceway circuit, and graded on PR skills, experience level, technical knowledge (do you know what scrub radius is? ), familiarity with the latest technology, and fi nally, driving ability, each competitor was sent away unknowing which was the winner. After hours of crunching numbers and deliberating, 2008 Skip Barber MAZDASPEED Challenge Champion and Rookie of the Year, Justin Piscitell, was given the green fl ag. Come mid-2009, he’ll be fi ghting for a win again... only this time, one that’ll likely land him in the pro ranks. To fi nd out more about club racing, check the offi cial SCCA site: www.SCCA.com Visit importtuner.com to fi nd out what it takes to build a spec MX-5, then hit up to get started.